This past fall, we introduced Universal Resource Scheduling Solution in Dynamics 365. Regardless of what type of scheduling your organization is engaged in, be it Field Service scheduling, Project Service Scheduling, Case scheduling, Lead scheduling, or maybe something completely custom, Universal Resource Scheduling Solution helps you book your skilled resources to the right work, at the right time, independent of workstream. With our first major update since our initial launch, we continued to focus on quality, performance and usability. We were also able to respond to some customer feature requests as well! Below you will find both a list, and a detailed explanation on the additions made in Universal Resource Scheduling Solution. Fulfilled and Remaining Duration is now an out of the box concept. There is now an out of the box way to track fulfillment of a requirement and filter out requirements which have been fully scheduled. Plugins automatically calculate the fulfilled and remaining duration of a requirement. The open requirements view has been updated to filter out requirements in which remaining duration is equal to or less than 0. Explanation of plugin logic – As changes are made to bookings or to the requirement duration, a plugin summarizes all related bookings and subtracts the estimated travel duration. If actual travel duration has a value, then actual travel is used instead. The difference between requirement duration and booking duration minus travel = remaining duration. Configurable Colors on Resource Summary Rows – Resource summary rows for the daily, weekly, and monthly schedule board views now have configurable colors. Colors can be set by double clicking any of your schedule board tabs on the top right of the schedule board, and editing below settings. Requirement Search – Users can now search for requirements in the requirements list on the schedule board. Hover over any column and filter by individual columns. You can apply filters to multiple columns at once. 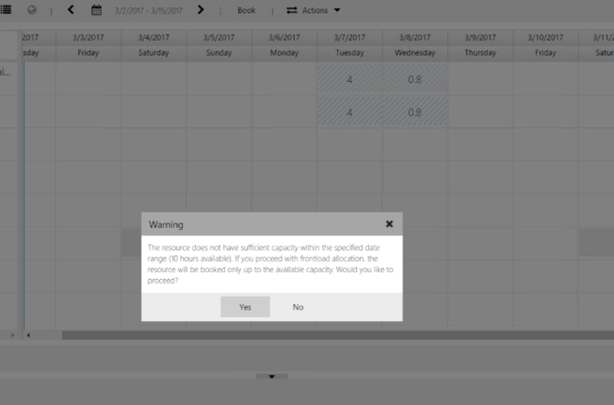 Front Load Warning Message – If user tries to book a resource for more hours than they are available using the front load allocation method, a warning message now appears. Undefined Territories – “Undefined option has been added to the territory filter. You can now display resources of a specific territory + resources that do not have any territories defined on a single schedule board. This also applies to requirements in the bottom panel. When “undefined” is added to the filter control, all resources that do not have any resource territories defined will be displayed. 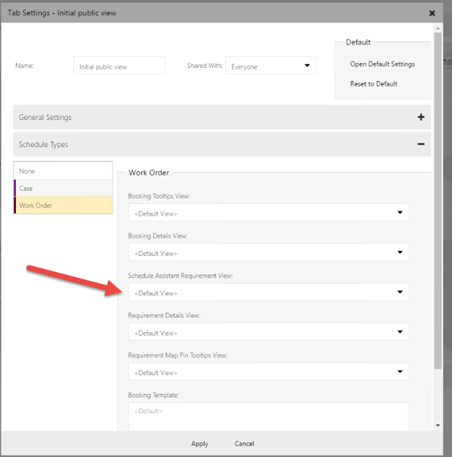 If “apply filter territory” option is selected in the schedule board settings, meaning the requirements list on the bottom is respecting the territory filter, then when undefined is added to the filter control, all requirements that do not have a service territory will be displayed in the booking requirements panel at the bottom of the schedule board. Time Component in Booking Dialog – In the booking dialog, if the requirement is less than 24 hours, there is now a time component in the dialog. 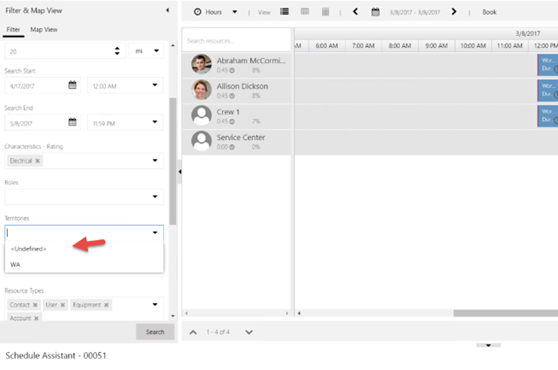 Initiate Search with One Button – New user experience to launch availability search on schedule board. When selecting a requirement in the bottom panel, there is only one option to find availability instead of two options. We used to initiate the search with a right click, and the user would select between searching the current board and search all resources. These options have been changed to be defaults stored on the schedule board tab settings. Users can still change the search mode on the fly in the filter panel after search has been initiated. 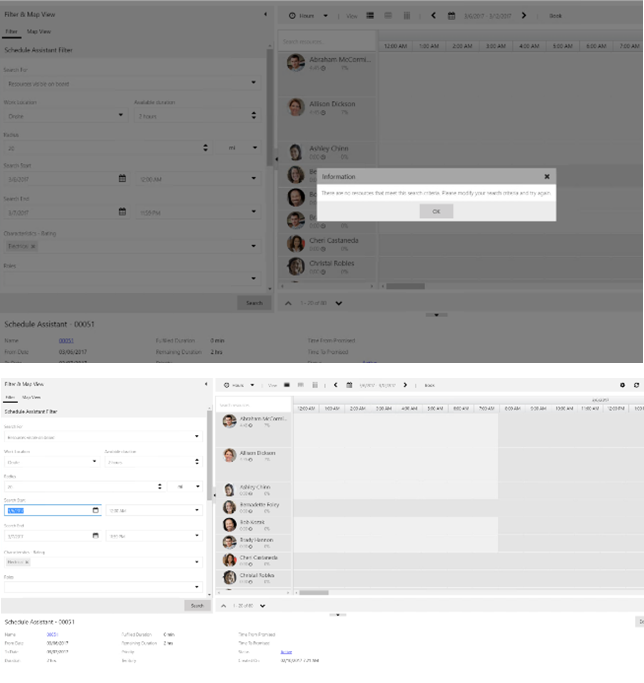 When searching for availability while in schedule board, in an effort to improve the users understanding of the change in schedule board modes from standard drag and drop to schedule assistant, there is now a dedicated panel which displays after launching the schedule assistant search. The panel displays information based on a view for which you can set different defaults for each type of requirement you may want to book. There is also a clear exit indicator in the panel to leave schedule assistant mode. Certain buttons on toolbar are now disabled when user searches for availability to avoid user confusion. 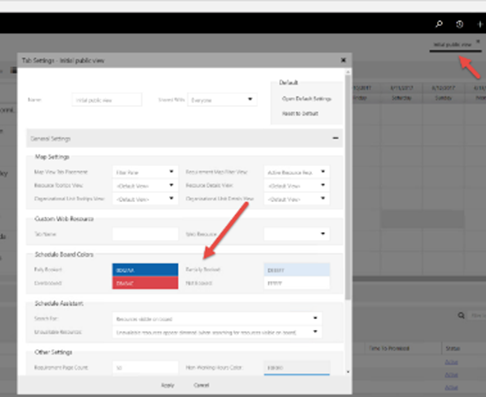 Auto Focus on Filter – When results cannot be returned in availability search, the filter panel pops open, focusing users attention on modifying search criteria. Default Search Dates – New defaulting logic for search dates when finding availability within schedule board. When a user searches for availability against a requirement, we use the following logic to set the date fields of the search. Check if there are values in time promised fields and if there are values, and they are not in the past, use them. If there are no values in time promised fields, use date window fields. If the date window fields have a value but are in the past, use these fields and then we will show error message that they are in the past. If the date window fields have values, use these fields, but still abide by the rule that we never change date to the past. 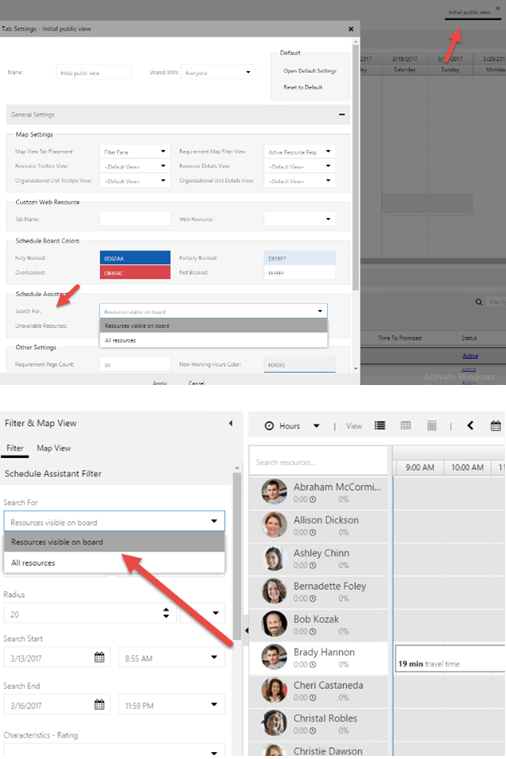 If a user does search for availability on a requirement in which the dates are in the past, the filter panel will slide open and the start date will auto focus. When a user manually updates the start time on the new Schedule Assistant filter control, if the start is changed to after the end, the end automatically updates as well. The date field on the schedule board map is now a button. Users can change the date to any date within the range of the currently selected dates on the schedule board. 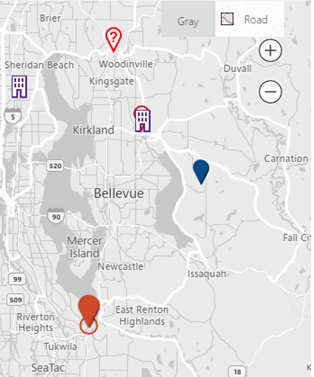 When user selects a map pin, the pin is now highlighted by adding a circle to the bottom of the pin. Enhancements to Auto Hiding of Pins – Adjustment to logic that automatically hides pins of a certain type at certain zoom levels. The levels with which map pins are hidden and displayed have been changed to be more inclusive by one level of zoom for all categories. Booking update time (large impact when customer is using Resource Scheduling Optimization solution. 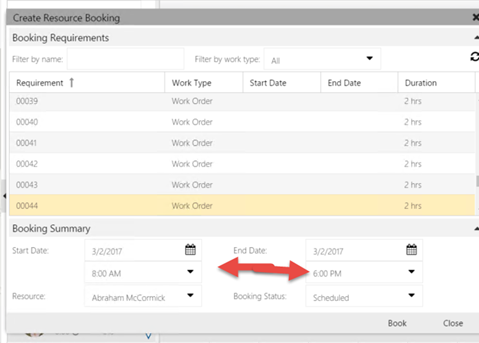 Load time on pop out schedule board when initiating schedule assistant using the book button on a form or view. 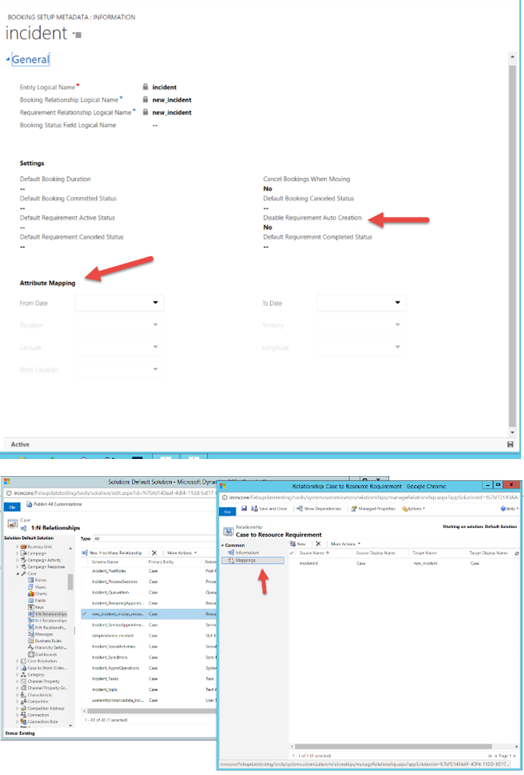 Location Validation on bookable resource entity. Resources of location type organizational unit (formerly company address) must have a latitude and longitude on the resources parent organizational unit. Resources of location type “resource address” must have a latitude and longitude on respective header (user, contact, account). Resources without a location type will not return in onsite searches when using schedule assistant. Default Values on auto generated requirements – Auto generate requirements feature will set the values on the requirement from parent schedulable entity using CRM mappings. When a user creates mappings from header (schedulable entity) to Resource requirement, either via attribute mapping on Booking setup metadata records or through normal CRM 1:N mapping, when the requirement is auto generated as a result of a booking being created which does not have a requirement, the auto generated requirement will use these mappings and inherit the values accordingly. If the “book” button was used for the header, the values will also be set based on these mappings unless they were explicitly set via the schedule board filter control (values such as work location, duration, start and end). After manually filtering out a specific resource on the schedule board, refreshing the mini map no longer will add that resource back into the filter. Clicking a requirement on schedule board always displays map pin. Removed certain map auto zoom functionality bettering user experience. Time component of requirement from and to date fields is no longer displayed in booking requirements grid on schedule board. Date and time format of user is now respected in filter control on schedule board. Schedule board details panel now supports the users date format. For right to left languages, the resource name formats to proper size on schedule board. Schedule board auto refresh fixes. When searching for availability, the dates/time that are outside of the search duration are now grayed out properly in all views of the schedule board. When user searches for availability for “all” resources and searches for more resources than what the paging setting can support, the paging buttons are now supported. When user pages for availability within the current board, when the user pages to the next page, availability now shows properly. When user is searching for availability, and searching for ALL resources, when paging to a different day, if that resource does not have availability, the resource is now hidden. Preferred resources are now passed in from requirements properly. Visual enhancements to show loading mask when user is searching for availability instead of white space. If a resource location does not have a value (not set to company address or resource address), resource will not return in onsite searches.